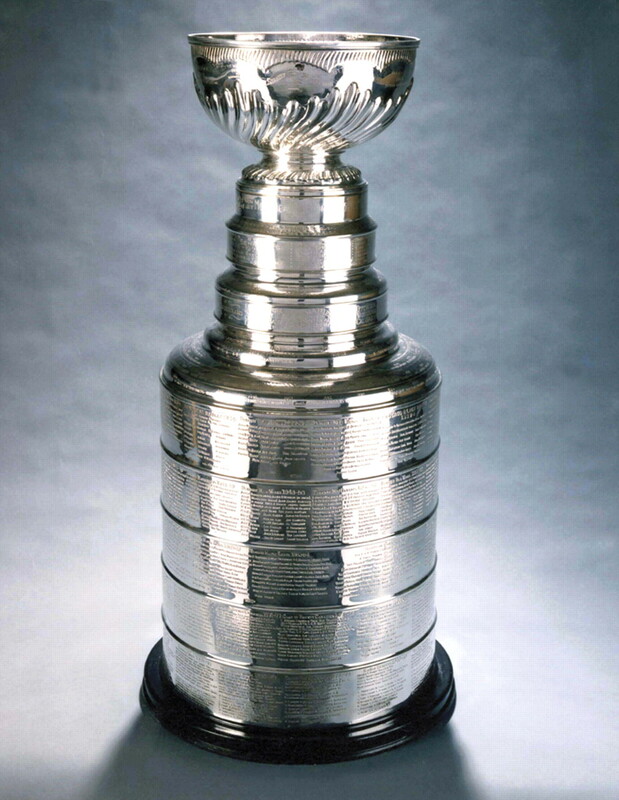 The Stanley Cup Finals begin tonight, and although my dearly loved New York Rangers will not be part of the contest this time, the Cup itself is still majestic and magnificent — and simply the best trophy in all of sports. It is a thing of beauty (unlike that… object that gets foisted on the winner of the World Cup) and simplicity (unlike the Commissioner’s Trophy in Major League Baseball), and everybody who wins it gets his name engraved on it forever. It’s not just a hunk of metal that gets passed around each year (unlike the NFL’s Lombardi Trophy). It’s a prize that is imbued with the spirit of the victors; every player becomes part of the Cup, literally and figuratively. It’s the hardest prize to win, but unquestionably worth it. Click on the link to see a brilliant cartoon infographic from The Nib that distills the Stanley Cup’s riveting history into pictures. You can watch the Chicago Blackhawks and the Tampa Bay Lightning begin the best-of-seven series tonight. Ice Hockey — in Africa! Forget the Jamaican bobsled team — when it comes to an unlikely sport in an unusual place, I think ice hockey in Kenya takes the cake! I love NHL hockey and think more people need to embrace the sport. The league needs this kind of dedication. There is only one place in the entire country to play hockey on ice — the Panari Hotel in the capital city, Nairobi — but enthusiasts also play on inline skates. In an odd coincidence, “Nairobi” translates from the local Maasai language as “cool water”! Goaltender Henrik Lundqvist of my beloved New York Rangers released images of the mask he will wear for the 2014-’15 season, and it looks like a stripped-down, simplified version of previous masks. It doesn’t seem as “busy” to me. King Henrik’s mask has his usual stylized crown on the front, with the Statue of Liberty on each side. As a hidden message, the three crowns on the mask (his, and the twin Lady Libertys) pay homage to the three crowns on the Swedish flag, (the “Tre Kronor”). The mask was designed and painted by Dave Gunnarsson, who does a lot of work for NHL goalies. 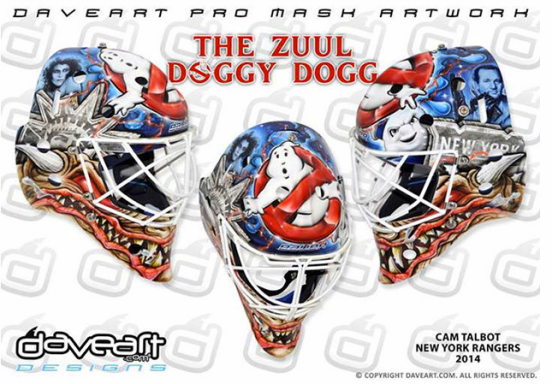 Backup goaltender Cam Talbot also has a new design ny Ginnarsson, this one paying homage to the New York-based comedy classic Ghostbusters. Matt Cooke: Once a Hockey Goon, Always a Hockey Goon? Anyone who still doubts that NHL Senior Vice President of Player Safety Brendan Shanahan is really really bad at his job comes Reason No. 345,458,945,678 why Shanahan needs to be fired: He thinks it’s perfectly fine that Pittsburgh Penguins assassin thug goon forward Matt Cooke sliced the Achilles’ tendon of Ottawa Senators defenseman Erik Karlsson, ending the star’s season. That’s right; the head of the department of player safety doesn’t think cutting 70 percent of a player’s Achilles’ tendon is an issue. Judge for yourself: The incident first happens about 7 seconds into this clip, but watch for replays from different angles that show a clear stomping motion by Cooke. 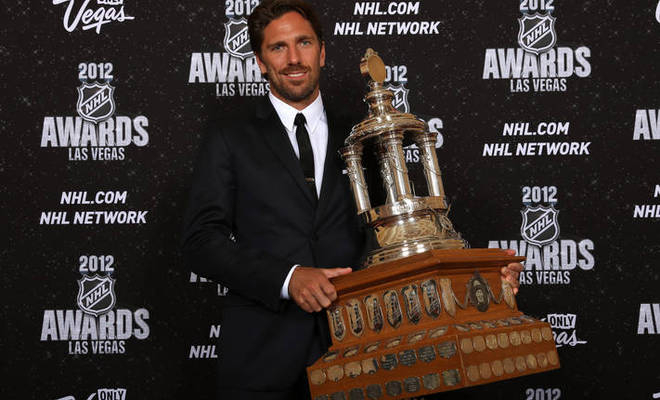 Henrik Lundqvist of the New York Rangers was finally awarded the Vezina Trophy as the NHL’s outstanding goalie for the 2011-’12 season. Lundqvist capped his seventh pro season by winning the accolade on his fourth nomination. It’s hard to express how proud I am of Hank, who was like a brick wall in backstopping the Rangers to their best finish since the 1993-’94 season, when they won it all. In my book, he should have won the Hart Trophy as the league’s MVP, because the Blueshirts would have gone nowhere without the King between the pipes, let posting the best record in the Eastern Conference (and second in the league) and surviving deep into the conference finals. 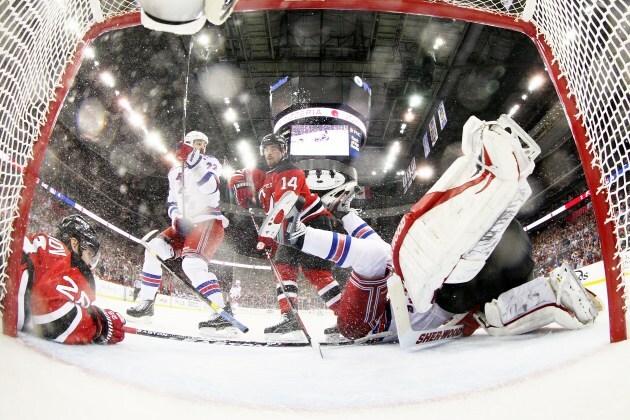 Happy Anniversary, New York Rangers! 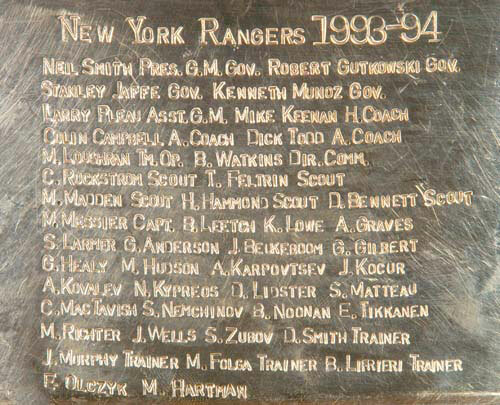 It was on this date in 1994, a mere 18 years ago, that the Blueshirts ended a 54-year drought quest and brought the Stanley Cup back to New York at last. 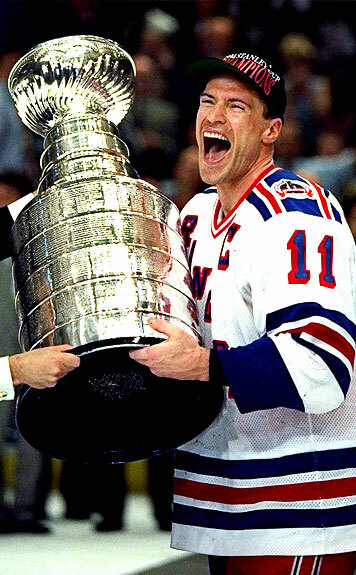 This feat was accomplished by the Messiah, Mark Messier, whose leadership of the Rangers crowned one of the most incredible careers in NHL history. This is the way the world ends: a pileup, a scrum, and a little black blip skitters into the net. I don’t know who scored, and I don’t care who scored. All that matters is he was wearing a red sweater, it was overtime, and my New York Rangers have been eliminated from the Stanley Cup tournament. The finals are next for some folks, but not me; the NHL season is over. My Rangers are out. After a long, hard-knock season that began in Europe and ended in the swamps of the Garden State; after winning the Winter Classic and featuring on HBO’s 24/7; after my brother and I went to dozen of home games at MSG and sang the goal song in the balmy humidity of Indian summer and the frigid depths of a cold, virtually snowless winter; after all that, it’s all over.